i (usually) got to pick out a new back pack every year for school. it was something i would get so excited for. when i went to college, this changed to a messenger bag. after college i had the brilliant idea that even though i was no longer in school, i should get a new purse at “back to school time” every year. and this is something i would get extremely excited for. 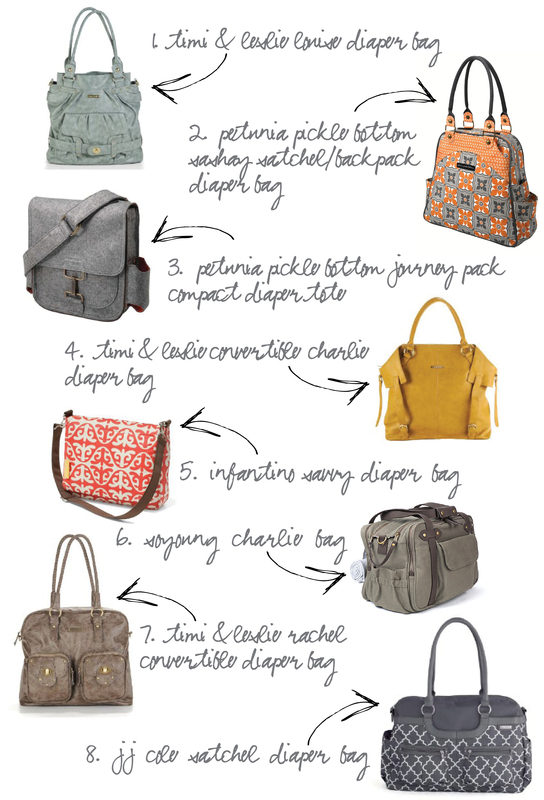 do you have any advise on diaper bag shopping? I love my petunia bag like #2. It worked great and I love having it as a backpack when both my arms are needed. So fun! ooh, good to know, thanks elisha! I like the look of #1 but #6 looks like what I would buy for practical space. As a mom of 5 for me having that strap to carry over your shoulder was huge. Once we got past 2 we now carry a cooler with lots of pockets. The big center for cold drinks for the older kids and parents; side pockets for bottles, formula, pacifiers, hand sanitizer; top pocket for diapers and wipes (sometimes extra clothes); and front pocket for snacks. Just consider what you want to carry in it and make sure it has the apprpriate amount of space. It is amazing the amount of things you will truck around with you from now on. In your case, you will want extra clothes, birp cloths, maybe diapers sacks to put dirty diapers in, coverup if you are breastfeeding, and so on.